How did this continental configuration affect the dinosaurs? During the Early Triassic period, the supercontinent Pangea allowed the precursors of dinosaurs to roam all over the huge landmass. As the supercontinent slowly split in two, it eventually cut off certain emerging dinosaur species from other species. The movements also caused certain ocean areas to widen and led to the inundation of parts of the landmasses, thus changing shorelines. This changed the types of vegetation and animal life in certain regions. It is difficult to mention all the minute changes that occurred over such a broad expanse of time. But there are generalities: for example, as the Atlantic Ocean opened, lakes that eventually became the ocean grew larger and smaller—and even divided. These changes were often accompanied by an absence or abundance of sea life. Shorelines often grew rich in plant and animal life. We know that some dinosaurs came down to eat and drink around these changing lakes, as their tracks have been discovered in sediment that once lay along the shorelines. 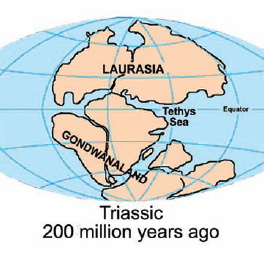 As Pangea began to break up, it formed two smaller supercontinents that scientists have named Laurasia and Gondwanaland (based on a map from the U.S. Geological Survey).